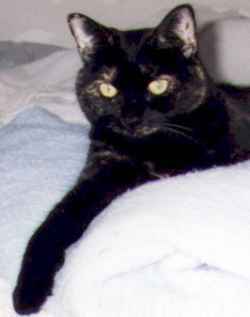 Susan adopted Katie in October 1998 when she ws 5 years old. Her previous owners had dropped her off at an animal hospital to be euthanized. The staff just couldn't bring themselves to do it, so they called Kitty Angels. Katie was so affectionate and sweet Susan just couldn't resist her. She's seen here posing on her favorite blanket. Katie loves to watch the birds at the feeder and her favorite game is "chase the string". 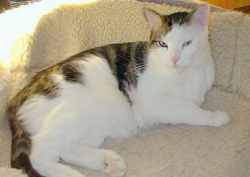 Oliver was an ill-tempered one year old boy who never got much attention. He was full of mats that had to be shaved, got razor burn from the shaving, had an infected gum and a loose tooth that had to be removed. He didn't even know how to purr! 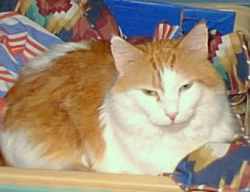 He became Patt and John's third 'Kitty Angel' in March 1996, and has since learned how to talk, play, purr, knead and snuggle. Smoky (right, nee "Sally") was adopted in January 1999 by Nancy and David, who brought her to their "North Country" home. It took her a while before she stopped hiding under every available piece of furniture at the approach of any human, but she has now become much more "people friendly". She loves playing with her adoptive older brother, Boots (left), and spends much of her time exploring every nook, cranny and other surface in the house. Nancy and David write, "She is a sweetie and we all love our 'little girl' (which is the name she is called most of the time!)"